Charles Barkley talks O.J. Simpson with TMZ Sports. A noticeably slimmer Charles Barkley has some advice to share with O.J. Simpson, who was granted parole last week after serving nine years in prison for his role in an armed robbery in Los Angeles. The NBA analyst and former Sixer was approached by TMZ Sports this weekend and asked whether he had any thoughts about the 70-year-old former running back, whose murder trial became a national sensation leading up to his acquittal in 1995. Will O.J. be able to stay out of trouble? "I hope so," Barkley said. "You know, he's done everything possible to screw this thing up and I hope he keeps his act together." Barkley's best advice to Simpson is just to "lay low," stay down in Florida and play golf for a little while. Not that Barkley, whose golf game is frequently ridiculed, seems willing to play a round with Simpson. 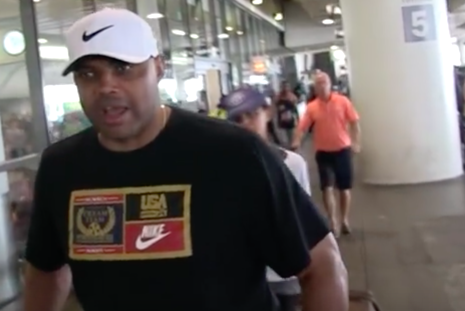 "Uh, I probably would not golf with him," Barkley said. Simpson is serving out his term in semi-protective custody — his lawyer told CBS News there have been threats against him — and he could be free to walk as soon as October. He still owes $33.5 million in damages to the families of Nicole Brown and Ronald Goldman after he was found liable for their wrongful deaths in a 1997 civil suit. Thanks to an estimated $25,000 a month he'll receive in pension payments, which are protected from seizure to pay off the civil damages, that should be enough for him to take Barkley's advice and hit the golf course.